DESCRIPTION: Hidrogenesse are an electronica art rock music duo and production team from Barcelona in Spain, whose pop artistry and industry impact has earned them the reputation of being 'indie scene mavericks' by the local Spanish music press. Hidrogenesse are an art rock electronica duo from Barcelona made up of Carlos Ballesteros on guitar and vocals and Genís Segarra on Synths. They are also music producers who remixes of current Spanish music acts has made them quite notable within the Spanish music scene. The refreshing sound, quirky style and deep music artistry of Hidrogenesse gives rise to the thought that perhaps that what 'Daft Punk', 'Air' & 'Phoenix' were to France in the 2000's, Hidrogenesse is to Spain. This highly underated act has caught the eye of deep thinkers and intelligentsia amongst the Spanish Music press but are yet to emerge on the musical landscape to the attention of the rest of the music press of the west. Of particular interest is their 2012 concept album 'A Bit Iffy' (Un dígito binario dudoso) dedicated to Alan Turing (English Scientist & the father of computer science). Here you can hear influences such as Kraftwerk and other key influences (check out the music video El Beso (The Kiss) below). As for other notable influences the band says that their key influences are The Smiths, Morrissey, The Associates, Sparks, The Magnetic Fields, Saint Etienne and the Pet Shop Boys. Hidrogenesse have released five albums to date. Discogs describe them as follows. 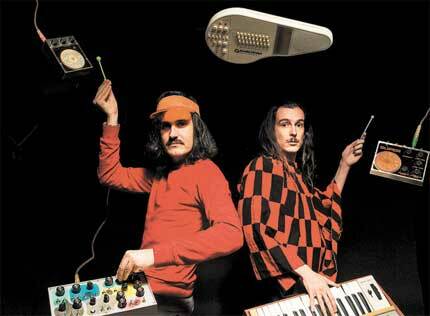 "Art-electronic rock duo formed by Carlos Ballesteros and Genís Segarra in Barcelona in 1996 with the idea of creating a conceptual KLF style band, in which any music genre becomes a medium to share their ideas. From their early steps since today they have moved through synth-pop à la Human League, instrumental italodisco, ceremony ballads, glitter rock, progressive, 90’s dance-music, sophisticated pop and fake rock’n’roll. Founding members of Austrohungaro collective and party organisers, their five releases over these years have won critical and media acclaim. With their more recent work "Animalitos" (2007) and the acompagnion album "Bestiola" (2008) they confirm their talent and manage to shape their artistic ambitions. The twelve tracks inspired in different bugs and creatures and based on 70’s music (gitter and krauk rock) achieve their intention of sharing their peculiar way of seeing the world." Please contribute any writings or images to this page if you have more information or history to share with the Music Industrapedia Community on HIDROGENESSE. Please visit our Contributions page for details. Also, please feel free to discuss the development of this page by clicking on the "DISCUSS" link at the bottom right hand side of this page.